Chuck Schumer Border Wall 2013 vs. 2018 - Truth or Fiction? A meme claimed that Sen. Chuck Schumer voted in favor of more miles of wall in 2013, but “shut down the government” over fewer miles of wall in 2018. Did Sen. Chuck Schumer vote for 350 miles of border wall in 2013, and shut down the government over 235 miles of border wall in 2018? VOTES FOR 350 MILES OF WALL IN 2013…. SHUTS DOWN GOVERNMENT OVER 235 MILES OF WALL IN 2018….. The meme made three central claims: that Sen. Schumer (D-New York) voted in favor of 350 “miles of wall” in 2013, that he objected to a lesser 235 “miles of wall” in 2018, and that his latter position led Schumer to shut down the government in 2018. Its latter claim was the easiest to tackle, since we’ve addressed the issue of ownership of the government shutdown of 2018 and 2019 on other pages. 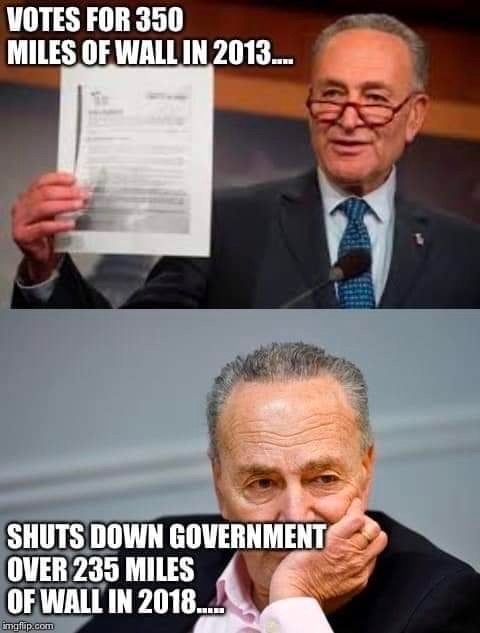 On January 16 2019, we examined a meme about the “Democrat Shutdown,” which held that the party helmed by Schumer and House Speaker Nancy Pelosi bore responsibility for engineering the weeks-long halt in federal operations. Trump was adamant that the decision to shut down the government was his and his alone, taking the unusual matter of stating on the record that he would not blame Schumer or Pelosi for the circumstance. 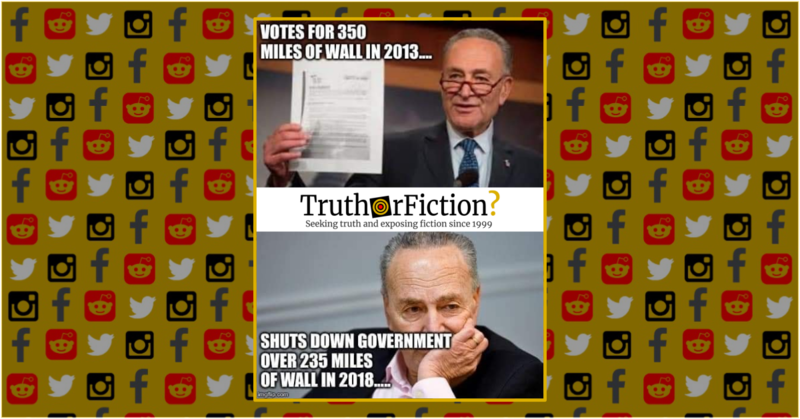 The meme’s first and second claims dealt again with what it heavily implied were conflicting actions on Schumer’s part — one, that he voted for “350 miles of wall” in 2013, and two, that he “shut down the government” over “235 miles of wall.” Just as two prior fact checks on this site touched upon issues of the claim, earlier variations of the same rumor abounded on social media. The Administration has requested $5.7 billion for construction of approximately 234 miles of new steel barrier on the Southern Bor der, a $4.1 billion increase over the Senate bill. In 2006, former President George W. Bush signed into law the Secure Fence Act of 2006, which called for about 700 miles of fencing along the border with Mexico. That’s a little more than a third of the length of the 1,933-mile border. Currently, there are 654 miles of fence on the border, including 354 miles of pedestrian barriers and 300 miles of vehicle barriers. An amendment later loosened the terms of the law and gave the Department of Homeland Security discretion in how and where to build it. Then DHS determined that it needed fewer miles of fence than initially designated in the law. Now, with the government shut down due to an impasse over $5.7 billion sought by President Donald Trump to fund another 234 miles of fencing, that law has been misrepresented in viral memes circulating on social media claiming that it came with a $50 billion allowance that wasn’t used. The post says Schumer helped put together a border wall deal in 2014. That’s wrong — there was no border barrier deal that year. It’s possible the creator of the post was thinking of a 2013 proposal that Schumer shepherded through the Senate. But characterizing the 2013 legislation as a $25 billion deal to fund a “border wall” runs into factual hurdles. The package included more than $46 billion for border security. The vast majority of that money ($30 billion) was for hiring more U.S. Border Patrol agents along the southern border. Around $8 billion would have gone toward building or repairing 700 miles of fencing (including some double-layer fencing) along the U.S.-Mexico border. (vii) $150,000,000 shall remain available for the 2-year period beginning on the date specified in paragraph (2)(A) for use by the Secretary for transfer to the Secretary of Labor, the Secretary of Agriculture, or the Attorney General, for initial costs of implementing this Act. The claim that Sen. Schumer shut down the government over 234 miles of wall in 2018 but voted for 350 miles of border wall in 2013 was convoluted and mostly false, except, in true disinformation fashion, for some details in the margins. As repeatedly established, President Trump insisted that he be credited for the shutdown, not Schumer. Schumer did not shut down the government, and the impasse was not over “234 miles of fence,” but $5.7 billion dollars. After the shutdown began December 2018, the White House released a January 2019 memo asserting that the requested money would build 234 miles of wall. Finally, the bill advanced by Schumer in 2013 focused on a number of provisions, and was not a “wall funding” bill in any direct way. Did the Media Ignore a Devastating Tornado in Cuba? Does Ariana Grande’s ‘Seven Rings’ Tattoo Actually Mean ‘Charcoal Grill’ in Japanese? Did Rep. Alexandria Ocasio-Cortez Say ‘All the Technology in the World Won’t Let Us Build a Wall in the Mountains’? Obama Gas Stations Pumping Free Gas In Poor Neighborhoods- Fiction! President Obama Failed to Salute at Veterans Day Service-Fiction!